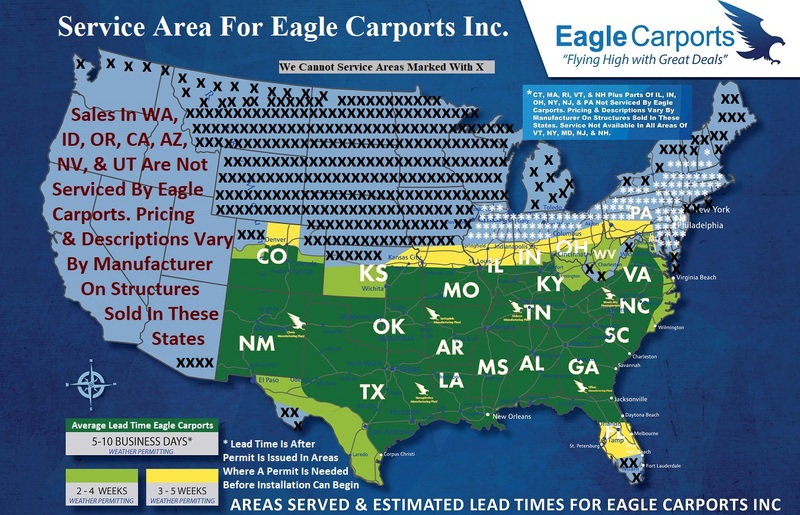 We are your Authorized Dealer for Eagle Metal Carports and Metal Buildings. We have pricing online for all of AL, AR, CO, FL, GA, IL, IN, KY, LA, MD, MO, MS, NC, NM, OH, OK, PA, SC, TN, TX, VA, & VW. We Offer Low Factory Direct Prices & Free Delivery & Installation In 38 States. You can purchase here online Metal Carports, Enclosed Garages, RV Covers, Boat Covers, Triple Wide Carports, Metal Buildings, Carports with Storage, and many other custom steel structures. For those of you that are looking over our website to find the perfect solution to protect your vehicle, equipment, or simply to create additional storage, then look no further, because you have found the right place. There are more products than just carports at Metal Carport Depot! We are experts on steel carports, garages, and storage buildings. We put our knowledge to work for you, by manufacturing most of the materials used in our products. We also work hard to give our customers more choices at prices that fit within most every budget. When you place your order with us, you'll get your product quickly. In many cases, you're product will be installed in two to four weeks! What impresses most of our customers is that the price of our carports, garages, and storage buildings includes installation! We Are Here To Answer Your Calls From 8:30 AM - 7:00 PM Central Time, Monday - Saturday. Call 1-800-324-5315. We Strive To Take Your Call Or Get You A Reply To You As Soon As Possible. With our knowledge, experience, quality materials, and excellent service, we are confident that you will enjoy the product you purchase from us. Mike, Beverly, Michael, Susan, & Laura.